If writing always feels like the LAST thing you want to do, it may be time to change your attitude about writing. Here’s how to do that…. I used a writing trick to help me with the laundry last week. I go to my Pilates class first thing every Saturday, then when I return home, I start thinking about putting on my laundry. But do I do that? Almost never. Instead, I eat a leisurely breakfast. I read the newspaper and enjoy a cup of tea or coffee and continue reading my current book. I lie on the couch reading and thinking — at the back of my mind — “I really should get started on the laundry now.” But because I don’t feel like it, I usually don’t. I’ll start [dreaded task] at 11 am. No, I’ll start it at 11:30. No, I’ll start it at noon. No, I’ll start at 12:30 pm. Etc. etc. etc. This kind of procrastination never makes me feel very good yet, on the surface, it feels less painful than doing the dreaded task. But what’s the problem with laundry? Whenever I start doing it, I’m always amazed by how easy it is. After all, my responsibility doesn’t involve carrying heavy clothing to a cold river and then beating it with rocks. Instead, it just requires me to take a laundry basket down two flights of stairs to our fully finished basement and our lovely energy-efficient washing machine. I don’t even need to get my hands wet! Sorting lights and darks takes less than five minutes. Then all I have to do is shove the clothing into the washer, add the soap and turn a dial. What’s hard about that? Absolutely nothing! But here’s the interesting part of the deal: I already knew laundry was easy. I’d created a monster in my own mind based on old information. My attitude came from the days when my mother had a mangle washer that we had to run our clothes through. (My left index finger lost its tip to that washer when I was an inquisitive four-year-old.) Then I remember when the washer died and we couldn’t afford a new one. As a result, we had to haul our clothing — for a family of seven — to a laundromat. Now that was real work! And extra boring, to boot. But today, the laundry monster no longer exists in my house. 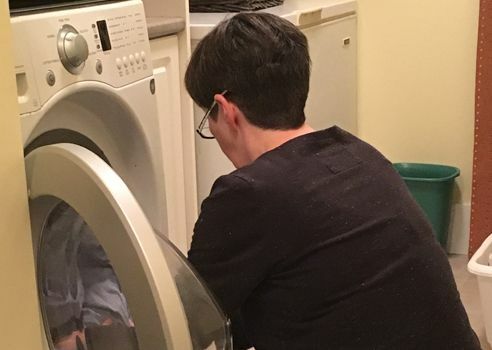 So this week, instead of saying to myself, “how horrible that I have to do the boring job of laundry right now,” I said, “how lucky that I get to do laundry so easily right now. Fifty years ago, it was so much harder. I LOVE doing laundry.”(Even though that last bit was a white lie.) The laundry time flew by, and my day was much easier to manage when I got the work out of the way in the morning. The key issue for me was articulating my mindset. Instead of thinking vaguely that I didn’t feel like doing laundry, I thought about the issue and made my attitude match the reality. Saying we LOVE doing something acknowledges the greater truth that it’s better than many other tasks we could be stuck doing. You can read more detail about these ideas here. I work with many troubled and frustrated writers and all of them benefit from getting their writing done shortly after waking up (waking at whatever time works best for them — not necessarily 5 am!) This is not because there is any “magic” associated with mornings. Instead, it’s a result of displaying a positive, take-charge habit and just getting the work done. This attitude works for laundry. And it works for writing, too. If you want some help improving your attitude toward writing consider applying to my Get It Done program. This three-month accountability group will give you the structure you need to become a more focused and productive writer. I’m hosting a no-cost webinar about how Get It Done works on Friday, Feb. 15 at 1 pm Pacific. Email me if you’d like to attend. No charge, but pre-registration is required. My video podcast last week aimed to help you become more efficient doing research. Or, see the transcript, and consider subscribing to my YouTube channel. If you have a question about writing you’d like me to address, be sure to send it to me by email, Twitter or Skype and I’ll try to answer it in the podcast. How’s your attitude toward writing? Have you ever succeeded in changing it? We can all learn from each other so, please, share your thoughts with my readers and me in the “comments” section, below. And congratulations to Elizabeth Cockle, the winner of this month’s book prize, Business Writing and Communication by Kenneth W. Davis, for a Jan. 31/19 comment on my blog. Anyone who comments on today’s post (or any others) by Feb. 28/19 will be put in a draw for a copy of the bestselling novel Asymmetry by Lisa Halliday. To leave your own comment, please, scroll down to the section, directly underneath the “related posts” links, below. Note that you don’t have to join the commenting software to post. See here to learn how to post as a guest.